Food sanitation and hygiene are the topmost priority in every meat processing plants. This is to ensure that manufacturers are compliant with food and safety standards. However, there is a need to optimise and create effective strategies to keep up with stringent regulations, rising demand and competition. And, that is the reason why automation and robotics are the most used technology in most meat processing facilities. So, for an effective and streamlined automated process, panel PCs are set up on industrial workstations. Another concern in a meat processing facility is that it bears harsh work conditions. This may cause corrosion or damage to the entire computing system. But, installing a stainless-steel industrial PC workstation can be a great computing solution. It features NEMA4 sealing capability which is known to be durable, corrosion-resistant and suitable for wash down areas. Thus, making this an ideal equipment for panel PCs in meat processing plants. 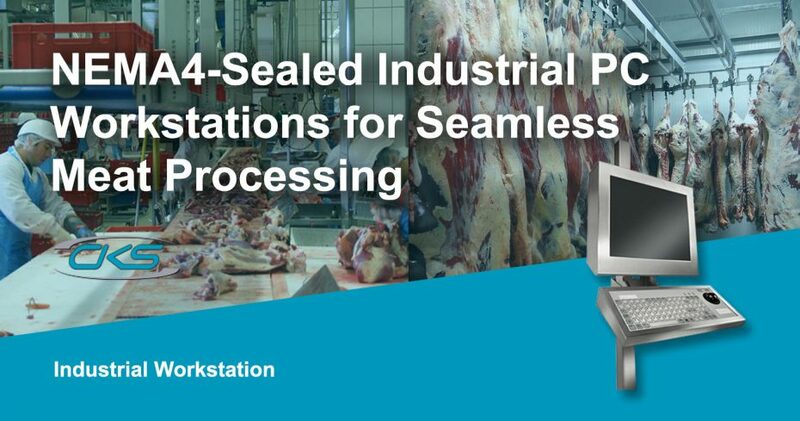 So, how can an industrial-grade workstation be optimised in meat processing operations? Read more on this blog and learn how industrial-grade workstations are optimised in meat processing operations. In compliance with the food and safety standards, it is important to utilise equipment that can withstand a sterile work environment in meat processes. Panel PCs that are set up on stainless steel industrial workstations are great options to improve operations in a sterile work environment. As such, specific computing functions for meat processing can be brought to the core of the operations. But, having installed panel PCs in industrial workstations enables the operators to systematically conduct tasks to prevent bottlenecks in operations. Its IP69K and NEMA4 protection allow it to last under extreme conditions such as harsh temperature, shock and dirt. Plus, with its VESA wall-mount brackets, embedded PCs can be easily set up on the production floor to create a centralised computing system. Bottlenecks in operations can be challenging to eliminate. So, setting up panel PCs to VESA-compliant ruggedised workstation promotes an ergonomic workplace. The accessibility allows the operators to make it easier to monitor automated task and other computing functionalities. Hence, it reduces operational bottlenecks, resulting in an optimised productivity rate. Since the rugged workstation is constructed with a 304 stainless steel grade, the equipment can last under harsh conditions. This type of material is perfect for areas with high exposure to meat by-products, moisture and other damaging conditions. So, it can withstand potential shock, dirt and abrasive conditions present in meat processing facilities. As a result, this workstation creates an ergonomic work environment whilst adhering to sanitation standards. Reliable equipment and machinery are essential in meat processing facilities to reduce maintenance and costly repairs. A rugged workstation with IP69k and NEMA4 rating means that it can last over extended periods. As it is not easily damaged by extreme elements, this equipment has a low-maintenance requirement. So, expect that it can help lessen operational downtime and expenditures for meat processing manufacturers. Given the fact that automation is changing every industrial application, meat processors are also adopting such kind of technology. But, they also need to remain compliant with the stringent sanitation standards. Therefore, setting up a computing system at the core of the production is just the beginning. These panel PCs must be built with a ruggedised workstation to ensure operational efficiency. That way, meat processing facilities can maintain high-quality food standard whilst having an increased production rate. Build a NEMA4-sealed industrial workstation in meat processing facilities today. Contact a trusted industrial computer manufacturer for more info.